This weekend, I did my second half-marathon. I was very worried about this one since I’d had problems on my first one – one that was on a very flat course. The Livestrong route is hilly. It goes up a long slow hill from the river to Ben White and then, in mile eleven, there’s a rather large hill on Enfield. What kind of sadist designs a 13.1 mile course with its largest hill in the 11th mile? Even meaner, there were more hills after that! Including two small ones in the last 600 meters. So not fair. 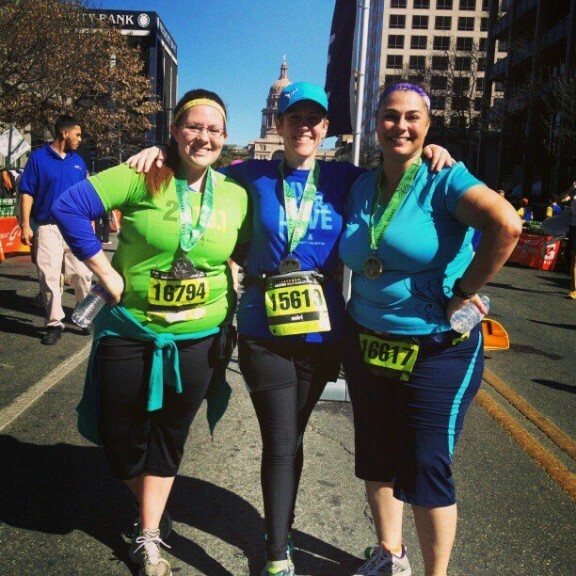 This was the event that was my original end-goal when I signed up for AustinFit with Corina and Lyndee. I remember thinking that the idea of walking 13.1 miles in one day was insane and that there was no way I’d ever be able to do it. Well, I have. Twice. And the really cool thing? I actually enjoyed the Livestrong race! I don’t know why it left me wanting to do more half-marathons when the Sugar Land one didn’t. Was it because Corina and Lyndee are such fun people? (Seriously, could not imagine people more different than me – they lapped up the cheers from the people along the sidelines and cheered back at them. Me? I always ducked my head and felt self-conscious.) Was it that the scenery along the route was more interesting? The fun crowds of people who came out to cheer friends and total strangers? I don’t know. But I felt strong during the race. I even felt strong going up that damn hill. (Well, strong and slightly on the edge of death, but a strong death.) Was it just where my head was at that day? I have no idea. It’s not because my hip wasn’t hurting, because it was. But I admit…I’ve already Googled and looked at dates for other half-marathons in the area. Given the hills, and my close to four hour time in the flat Sugar Land event, I was paranoid about not being able to finish in the four hour limit and, thus, not get my medal. I wanted my darn medal! To finish in four hours, you need to have a pace of at least 18 minutes a mile. Worried about the late hills, I decided to try for 17 minutes per mile to leave a bit of a buffer. So, as we crossed each mile marker, I would look at my watch and add 17 to the time it showed. I kept getting a surprise and moral boost by beating that new goal at each mile…even the one with the big hill. Thanks to AustinFit for getting me up to 13.1 miles. Thanks to Lyndee and Corina for being great race walking partners. (And sorry for abandoning you around mile 10…I just needed to go at the pace my body wanted me to.) Thanks to Brian for being around mile 7 and taking our no longer needed jackets and long-sleeved shirts. Thanks to all the people cheering along the way – I might have ducked my head and looked embarrassed, but I appreciated you. This entry was posted in Fighting the Limp and tagged in half-marathon, walking.